We hold expertise in offering a wide range of optimum quality Pear Shaped Diamond to our valuable customers. Multi Color Cushion and Pear Shaped Diamonds. We are offering the wide range of Pear Shaped Diamond. Clarity : IF to I3. 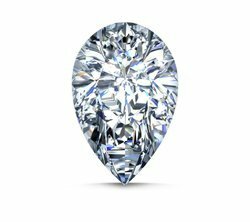 he modified brilliant-cut pear shaped diamond is a combination of a round and a marquise shape, with a tapered point on one end. The diamond is always worn with the narrow end pointing toward the hand of the wearer. Our customers can buy from us, Pear Shape Blood Stone with a combination of red, yellow and orange colour. These stones are available in a large variety of alluring designs and various attractive patterns to fulfill the needs of our valued customers.